The Methodist Librarians’ Fellowship is organized to promote and improve Methodist librarianship and to further interlibrary cooperation to that end. Download the minutes of previous meetings. View the list of members on Google Sheets. 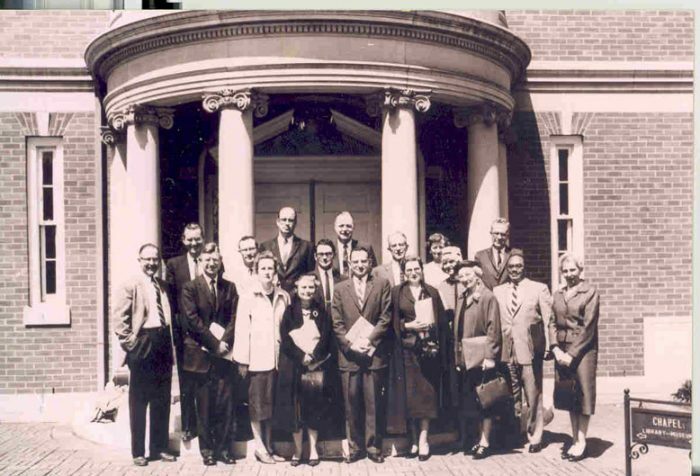 1st row (from left to right): 1st person, Richard Cameron–professor of Church History at Boston University, 3rd person, 4th person, 5th person, Emily Chandler– librarian at Westminster/Wesley Theological Seminary, 7th person, 8th person, 9th person. Starting from the left, the third man over (which makes him the second in the front row) is Richard Cameron, professor of Church History at Boston University. In the very back row, in the center (of the two back there, the one on the right) is Gerald McCullough (sp?) – longtime official of the Board of Higher Education. Moving right and down one row, may (or may not) be Douglas Chandler, Professor of Church History at Westminster/Wesley Theological Seminary. In front of him is Emily Chandler, Douglas’s wife, librarian at Westminster/Wesley Theological Seminary, until she relinquished the post in favor of Roland Kirchner, shortly after the Seminary relocated to Washington, DC. Professor Logan can’t recall the name, but he is pretty sure that the man in the first row, second from the right was at Gammon. What is the name of this organization? The Methodist Librarians’ Fellowship. What is its purpose? It shall encourage Methodist librarianship and further interlibrary cooperation. III. Who may be a member? Anyone associated with Methodist librarianship. What officers are needed? There shall be a chairman, a chairman-elect (program-chairman), and a secretary-treasurer. When shall meetings be held? At the call of the chairman when needs arise and means are available. I also have a copy of the letter Decherd Turner sent to Page for the 40th anniversary in 1959. It states the meeting was held in Nashville, at the Methodist Board of Education building, April 13-14, 1959. It was a call to advise the Microtext Committee of the Association of Methodist Theological Schools, during which the Fellowship was created. This meeting was to create a list of Methodist materials to be filmed by the Microtext Board of the American Theological Library Association, Dr. Raymond P. Morris, chairman, and would be done under a Sealantic Fund grant. The three-page minutes of the Methodist Microtext meeting list the committee members (Dr. Richard W. Cameron, Dr. Douglas B. Chandler, Dr. James W. May, Rev. Decherd Turner Jr., Dr. Gerald O. McCulloh) but there is no listing of the librarians in attendance. To subscribe to our group discussion list (methodist-librarians), contact the Member Programs Department.